Topics covered in the course were: concepts and mainstreaming of gender concerns in agriculture; research methods; interrelations among climate change, food security, and gender; leadership and project management; development of interpersonal and intrapersonal skills; business planning; and seed production. To supplement the formal sessions, the women got their feet wet in the fields by transplanting rice seedlings and testing several farm machines. They also had the chance to interact with and interview women members of CARD, a Philippine microfinance institution based in Bay, Laguna. 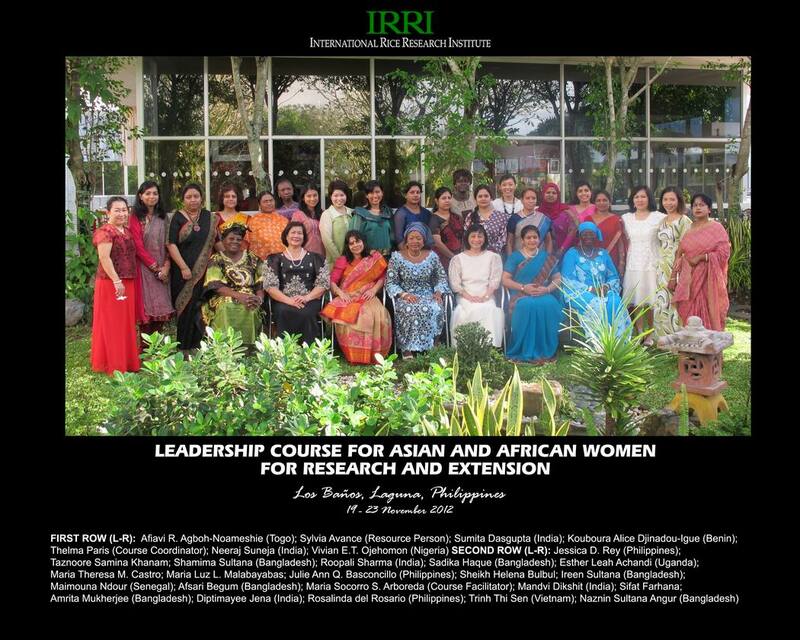 The participants were from Togo, Benin, Senegal, Nigeria, Bangladesh, India, the Philippines, and Vietnam. The course was held 19-23 November 2012 at the IRRI Training Center as a major output of the gender strategy under the Global Research in Science Partnership (GRiSP), and was the ninth time it was offered. It was coordinated by Thelma Paris, socioeconomist and gender specialist at IRRI, and Noel Magor, head of the Training Center. The coordinating team acknowledges the support of Umesh Shankar Singh, coordinator of the STRASA Project in South Asia; and resource persons Bas Bouman, Gelia Castillo, Sylvia Avance, Eugenio Castro, Jr., Thelma Paris, Maria Socorro Arboleda, Alfred Schmidley, Joyce Luis, Maria Angeli Maghuyop, Anilyn Maningas, Macario Montecillo, and Priscilla Comia.